Every year brings some cinematic surprises, but here’s something truly unexpected: One of the best movies of 2018 was shot a century ago. Who could have guessed that when Peter Jackson was innovating cinematic techniques for grand fantasies like “The Lord of the Rings” and “The Hobbit,” he would eventually use them to service solemn reality? 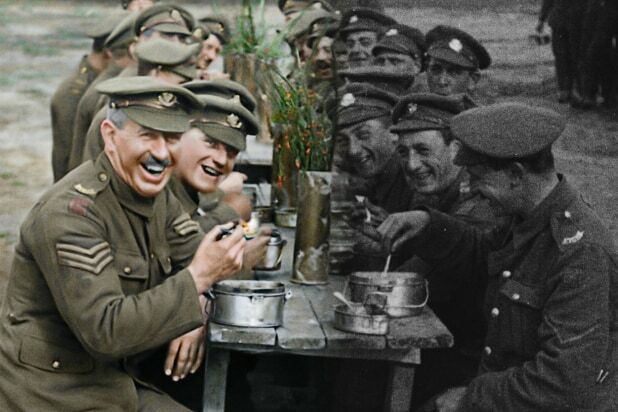 “They Shall Not Grow Old” — which takes its name from Laurence Binyon’s 1914 poetic tribute “For the Fallen” — started like any ordinary, well-intentioned documentary: Great Britain’s Imperial War Museum approached Jackson about honoring the centenary of the World War I Armistice. But when he began sifting through their archival footage, it looked like, well, archival footage from 100 years ago. Given that there are already plenty of traditional docs about WWI, Jackson set about creating a new experience from antique materials. He and his team spent years upgrading the museum’s old footage (which was shot at 13 frames per second) to the contemporary speed of 24 frames per second. If the traditionalist in you is already concerned, you may not want to hear about the digitalized clarity, 3D glasses or — hold on to your bowler hat — colorization. But reserve judgment, because Jackson achieves exactly what he wants: a fully immersive event, in which we understand the experience of WWI soldiers as we never have before. The contemporary priority of including a wide range of perspectives has been a great asset to culture overall, but Jackson consciously chose to keep his focus narrow here. His intention was to connect us to the experiences of front-line infantry soldiers in a visceral way, and he has succeeded brilliantly. While we hear the voices of veterans remembering their motivation for joining up (patriotism, excitement, escape), we see the excited, wide-open faces of boys actually living in those moments. And so many truly are boys, some as young as 14. But as the days and months pass, we watch them moving to the front lines, attempting to find some shelter in rat-infested trenches and blowing off steam with remarkable silliness, before facing down death and, in only some cases, walking away. There is no safe distance here, in the form of grainy footage or unfamiliar archaisms. Indeed, the immediacy of their reality becomes almost overwhelming, and there are moments when you will assume Jackson must have staged visual reenactments. Your heart will hope he did. But ultimately, we can be grateful that he forged a different path instead.